Join us at Stanbrook Abbey (Jennet Tree Lane, Callow End, Worcester, WR2 4TY) on Wednesday 30th May 2018 for an inspiring talk by Phil Howl about this Worcestershire Architecture Award winning project. Arrival from 6pm; talk commences 6.30pm, finish 8pm. 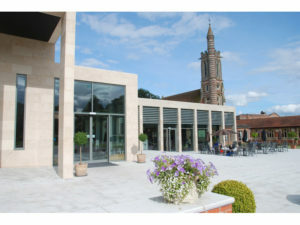 Phil will tell us about the conservation and restoration work Howl Associates (http://www.howl.co.uk/projects/stanbrook-abbey) have completed, along with a new extension, all part of a project to convert the abbey into the hotel, wedding venue and conference facility that it is now. There will also be a short guided tour of key spaces. Following the talk, exciting information about the Worcestershire Architecture Awards 2018 will be announced. Refreshments will be provided, and some of the Worcestershire Architecture Awards 2017 entries will be displayed for you to peruse at your leisure. Due to the WSCA being awarded RIBA LIF funding this year there is no charge for the event, but if you could let us know if you plan to come along it would be appreciated so we can confirm numbers with the venue for refreshments – email us at mail@ribaworcestershire.co.uk.